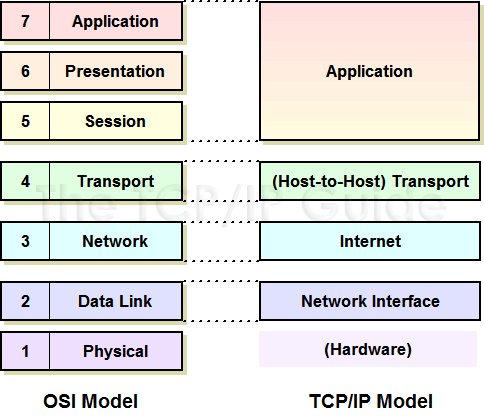 The TCP/IP model uses four layers that logically span the equivalent of the top six layers of the OSI reference model; this is shown in Figure 20. (The physical layer is not covered by the TCP/IP model because the data link layer is considered the point at which the interface occurs between the TCP/IP stack and the underlying networking hardware.) The following are the TCP/IP model layers, starting from the bottom. The TCP/IP architectural model has four layers that approximately match six of the seven layers in the OSI Reference Model. The TCP/IP model does not address the physical layer, which is where hardware devices reside. The next three layersnetwork interface, internet and (host-to-host) transportcorrespond to layers 2, 3 and 4 of the OSI model. The TCP/IP application layer conceptually blurs the top three OSI layers. Its also worth noting that some people consider certain aspects of the OSI session layer to be arguably part of the TCP/IP host-to-host transport layer. As its name suggests, this layer represents the place where the actual TCP/IP protocols running at higher layers interface to the local network. This layer is somewhat controversial in that some people don't even consider it a legitimate part of TCP/IP. This is usually because none of the core IP protocols run at this layer. Despite this, the network interface layer is part of the architecture. It is equivalent to the data link layer (layer two) in the OSI Reference Model and is also sometimes called the link layer. You may also see the name network access layer. On many TCP/IP networks, there is no TCP/IP protocol running at all on this layer, because it is simply not needed. For example, if you run TCP/IP over an Ethernet, then Ethernet handles layer two (and layer one) functions. However, the TCP/IP standards do define protocols for TCP/IP networks that do not have their own layer two implementation. These protocols, the Serial Line Internet Protocol (SLIP) and the Point-to-Point Protocol (PPP), serve to fill the gap between the network layer and the physical layer. They are commonly used to facilitate TCP/IP over direct serial line connections (such as dial-up telephone networking) and other technologies that operate directly at the physical layer.